Learning to give out Love. I believe this to be true. (I also believe many other things on this same topic – of Love – but we’ll start with this one sentence). Learning to give out love. I have been learning this lesson, on a conscience level, for some time now. I try to love everyone. I know, your probably rolling your eyes right now. Well stop. This lesson and the way I have learned to conduct my life due to learning it, makes me courageous. It makes me attractive. It makes the world come alive in the people before me – the struggle, the beauty, the human connection in it all. Learning to give out Love is a risky business. It opens you up to the most naked form of vulnerability. It requires humility and sacrifice. Those aren’t words we use in our everyday lives, but there are people, everyday, who live lives of humble sacrifice. I try to love them; to think of them when I practice loving. And now, I know this is a really big jump, but I love Valentine’s day because I have used it as an opportunity to let people in my life know that I love them. I have used Valentine’s day, and the tradition of sending Valentine’s cards as a means of expressing my love to all those that I can think of (and afford to buy stamps for). Family that are far far away, friends that don’t know I think of them as friends (and don’t have any others), lovers that have touched my heart though they may not have stayed in my life, neighbours that make the world that much more colourful and diverse, and my mother. I have sent them all cards of love. 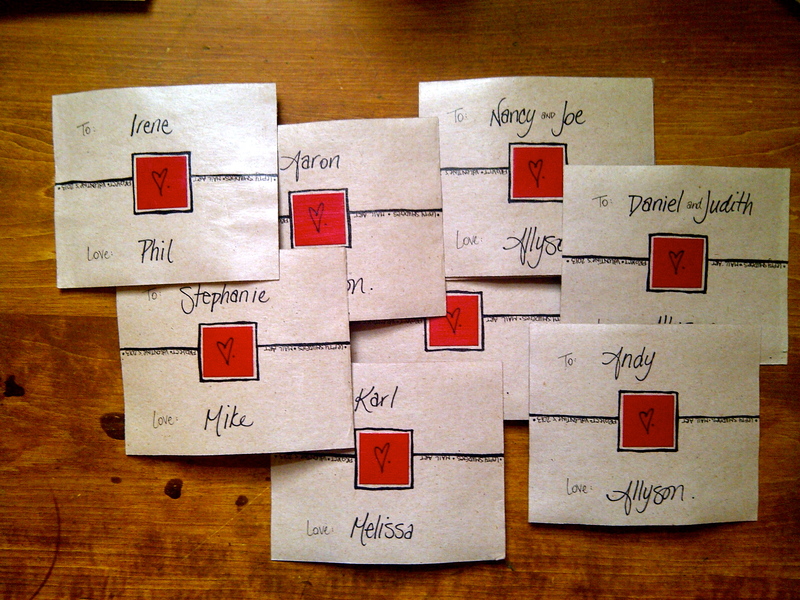 Lefty Smudges’ very first project, the very first time I sent out cards on behalf of others, was for Valentine’s day. This project is very dear to my heart. This project is the one that I am most attached to. For years I have been practicing the art of correspondence and the act of Loving. Valentine’s day cards are the most beautiful cards I will ever make – it’s the Love that does it! It is my pleasure, and my privilege, to share this year’s Lefty Smudges Valentine’s Day Mail Art Project with you. It is my hope that you will support this project by enabling me to send out ALL the cards to ALL those we love. I will write again soon, and let you in on the details of the design, the materials, and what a day in my studio, working on these cards, looks like. So come back, and stay in touch. I was lucky enough to receive a Valentine’s last year and it really made my day. If you are like most people, all you get in the mail are bills and flyers. So it is a really lovely surprise to receive a card that you know is coming from the heart and that was made especially for you.